Get a FREE Sub from Subway with this Subway coupon! 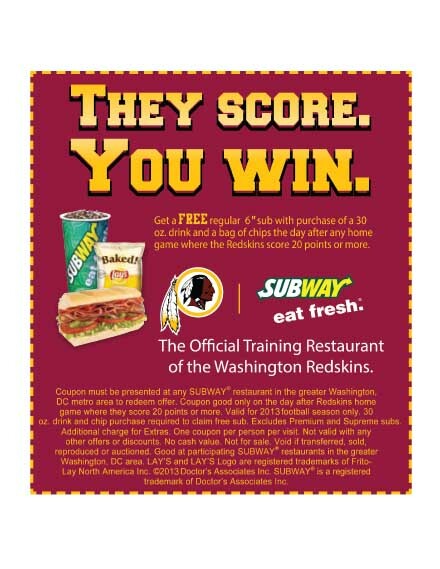 This coupon is actually very unique in the sense that you can only get a FREE regular 6″ inch sub from Subway with the purchase of a 30 oz drink and bag of chips the day after any home game where the Washington Redskins score 20 points or more. Interesting right? I don’t really see these type of “conditional” coupons often but let’s hope the Redskins win a bunch of games, or at least score 3 touchdowns, or a handful of field goals. 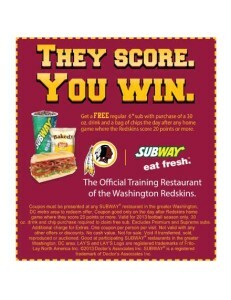 Subway eat fresh as the official training restaurant of the Washington Redskins. Coupon must be presented at any Subway restaurant in the greater Washington DC metro area to redeem offer. One coupon offer per person. It’s quite a coincidence that this coupon would be released shortly after the controversy regarding the Washington Redskins being a racially insensitive name for football team considering it’s derogatory reference to Native Americans by their skin color and considering America’s history with Native Americans. It’s a topic that really hits home with many people and makes us reconsider a lot of norms that could be offensive to people without even considering how they feel. The owner of the team has stated recently that the name will remain the same. I just hope that they respect the native American culture and celebrate it’s traditions rather than focus on (what many consider) the racial slur that defines the football team’s mascot. All in all, it’s important to remember that we all are united and let’s show that strength by scoring well on football games and treating the Washing residents to a nice FREE sub coupon this football season!